See also Greatest Conservative Sports Stars, and Blacklisting Tim Tebow. Timothy Richard "Tim" Tebow (born August 14, 1987) is an outspokenly pro-life, Christian football player who initially gained fame by winning championships for the University of Florida Gators. An extraordinarily athletic and versatile quarterback, Tebow is 6'3" and weighs about 240 pounds. He was the first sophomore to win the Heisman Trophy and led the Gators to two BCS Championships during his four years playing for UF in Gainesville, a rare feat. Currently he plays minor league baseball for the New York Mets. Tebow has been repeatedly excluded by the NFL despite playing far better than what is needed to make a team, and despite having a higher quarterback rating than some players who are not cut. The most plausible explanation for this is the increasingly pro-homosexual and pro-gambling bias of the league, contrary to the Bible. The NBA and major league baseball have Bible-quoting stars, but the NFL particularly panders to the pro-homosexual media. He was selected by the Denver Broncos as the 25th pick of the first round of the 2010 NFL Draft. In 2011, with the team in last place, the Broncos decided to start Tebow as quarterback. Tebow had an impressive seven-game winning streak, and took the Broncos to the division championship. In the first round of the playoffs, Tebow led the Broncos to a stunning upset victory over the Pittsburgh Steelers with 316 passing yards for an average of 31.6 yards per toss, confounding his critics and causing a million searches on the internet for the meaning of John 3:16.The Broncos were subsequently eliminated by the New England Patriots the following week. Despite Tebow's success, that off season the Broncos signed quarterback Peyton Manning to a deal costing nearly $100 million, and then immediately traded Tebow to the New York Jets. During the 2012 season, Tebow was largely kept on the bench despite continued poor play by starting quarterback Mark Sanchez. For example, on November 22, Sanchez played the entire game against the Patriots, a game which the Jets lost 49-19. Even after Sanchez repeatedly turned the ball over by throwing interceptions and fumbled the ball by running into his own lineman after a botched handoff, Tebow did not get into the game. Finally, Jets coach Rex Ryan benched Sanchez, but he (or the owner) still refused to give Tebow any real playing time. The repeated refusal to play Tebow became a bigger story than which side won or lost the game itself. On April 29, 2013, after the draft weekend, the unsuccessful Jets waived their rights to Tebow. On June 10, 2013, Tebow signed a contract with the New England Patriots, but the Patriots released him before the start of the season after barely giving him a chance. The Patriots may have been using Tebow as a public relations gimmick to deflect bad publicity about the team, whose star tight end was being prosecuted for murder. In 2015, Tebow signed with the Philadelphia Eagles but was released after the team's final preseason game, despite playing far better than necessary to make the team. Tebow is one of Conservapedia's Greatest Conservative Sports Stars and was a runner-up for Conservative of the Year 2011. Tebow was homeschooled until college. He is an outspoken pro-lifer, and his mother had been told to have an abortion rather than to give birth to him. Tebow appeared in a pro-life television ad that aired during the 2010 Super Bowl, risking retaliation against his career by pro-aborts and the liberal media. 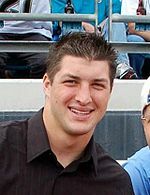 Tebow volunteers on mission trips, one of which in the summer of 2008 to the Philippines was chronicled in an issue of the ESPN Magazine. His faith in Christ is a well-known fact inside and outside the sports world. Tebowing is the act of kneeling on one knee, resting your head on your fist and giving thanks. It is named for Tebow's fashion of public prayer. And when you pray, don't be like the hypocrites. They love to pray when standing in the synagogues and in the street corners, so that they may be seen by men. I tell you truly: They will get what's coming to them. But you, when you pray, go into your inner room, close your door and pray to your Father who is in secret, and your Father who sees what is done in secret will reward you. Liberals in the sports industry have been long opposed to Tim Tebow because they do not want the spread of Christianity in the NFL. He has been subjected to harassment and criticism for his outward expression of his faith in Christ. Liberals use the accusation, with no basis, that he is a sub-par player as a shield for the fact that they are afraid of the negative reaction of the lame-stream media, which they fear will result in negative publicity and loss of sponsorship for the NFL. Their blinkered philosophy cannot understand that embracing Tebow and his message would lift the NFL out of its current doldrums. ↑ NFL career stats For example, Tim Tebow has a higher career quarterback rating than Mark Sanchez, and yet Sanchez was given more opportunities by the NFL than Tebow was. ↑ As a pro, Tebow was voted by his peers to be one of the top football players, but more recently he was also voted by fellow NFL players as the League's most overrated player, with his former teammate and fellow quarterback Mark Sanchez taking second place. Tebow responded by laughing it off, observing the inconsistency in the polls. This page has been accessed 46,129 times.